Posted May 21, 2015 by eventreb & filed under Event Design. The weather is beginning to warm up, which is why catering is just beginning to cool down. 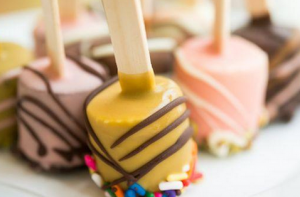 Check out some of these sweet treats that you might see at your next event. No doubt, you’ve seen the non-frozen counterparts, but don’t be surprised the next time you bite into one with a little surprise. If the Cronut taught us anything, it’s that classic desserts can sometimes work even better when matched up with another equally classic dessert. Such is the case with these jewel-like macarons filled with semifreddo instead of buttercream in flavors like strawberry-chamomile, Mexican chocolate and juniper-lime. Some caterers are taking the idea of a popsicle to the next level. This is the choose-your-own-adventure version of an ice cream bar — pick a size (mini or regular), choose one of the featured gelato or sorbeto base flavors, then select a chocolate dip and drizzle. There are even fun crunchy elements like coconut, sprinkles and chopped nuts that can be added before the chocolate hardens. Now everybody has their own memory of what their sno-ball was like growing up. 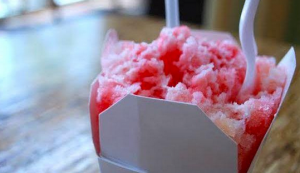 Bakery owner David Guas grew up loving the Plum Street sno-balls of New Orleans, so he models his after those — even serving them in Chinese take-out containers instead of Dixie Cups. Guas’ come in such flavors as wedding cake, dreamsicle, strawberry and nectar all of which can be ordered topped off with condensed milk. It’s a fun treat for any event. What sweet frozen treats are you planning to serve at your next big event to cool your guests down? Tell us on social media!